Kittery Maine is a town for which the phrase “But wait, there’s more!” was invented. The town has become almost synonymous with the terrific shopping to be had at the Kittery Outlets, but, boy, will you be surprised when you leave the Route 1 shopping area and explore places like Kittery Point! Didja know, for instance, that Kittery is the oldest town in Maine (1623), the southernmost town in Maine, and that you can explore forts there and go to the beach there? Didja know that Kittery is becoming foodie central in Southern Maine due to its’ abundance of fine dining and gourmet food shops? What about all the art galleries in Kittery? Didja know that America’s oldest naval shipyard is in Kittery Foreside, even though it’s called the Portsmouth Naval Shipyard? 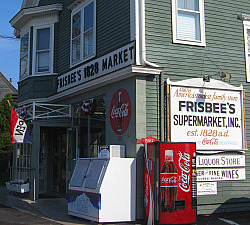 Bet ya didn’t know that the building with the record of the oldest family operated general store in North America is in Kittery, either (Frisbee’s Market). Or that Maine’s first lighthouse - when you come in from the south - is in Kittery (Whaleback Lighthouse). Didja know you could kayak up Chauncey Creek in Kittery, put in at the Chauncey Creek Lobster Pier, eat lobster creekside, then paddle out again? And the Kittery Naval and Historical Museum is the closest you’ll probably ever stand to an 1804 French-made, flawless crystal, original 2nd order Fresnel lighthouse lens. Just another unique little treasure in a unique little treasure of a town. Staying in York and going to Kittery for the day? Easy. Take Route 1 South. You’ll be there in about 10 minutes. It doesn’t matter what you do or how you drive - it’s impossible to get lost. Route 1 bisects both towns and when you enter Kittery, the Kittery Outlet malls flank both sides of the road. But there’s another way to get to Kittery from York, or vice versa, and it’s gorgeous – Route 103.